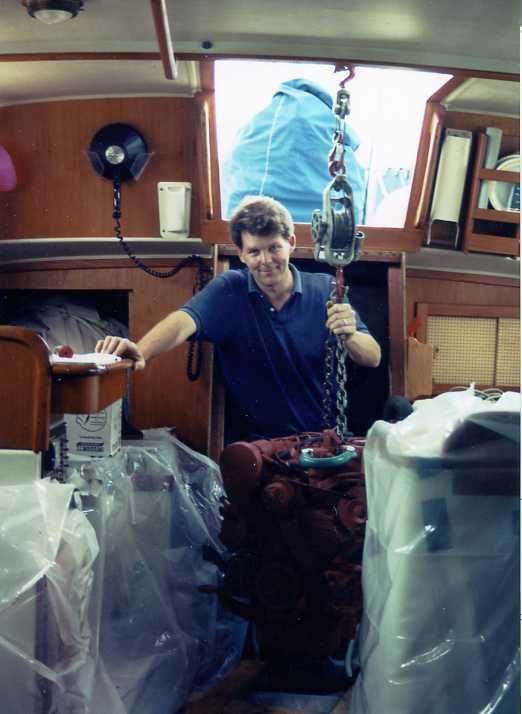 Some years ago I had to remove the engine on Ocean Cloud due to a seized transmission. Without getting into the 1,2,3 steps involved, here is the overall plan of how to lift it and what to do with it next. Since the purpose of this removal was to get the transmission off, it wasn’t necessary to remove the engine entirely off the boat. This situation would also apply to work on the prop shaft coupling and replacement of the prop shaft which I believe can only be done by removing it towards the interior of the boat (unless you remove the rudder). It could also apply to engine mount replacements. If you want the engine completely off the boat, read no further because you’ll need another technique. I considered using the boom, but decided against it. To lift from, I made a wooden beam to sit atop the companionway opening. According to the manufacturer, the engine weighs 490 pounds. I’d estimate 600 with exhaust, brackets, fluids and misc. So think in terms of at least 1000 pounds when you make your beam. Sorry, but I don’t remember what size board I used. You might find something and set it up on the dock and get three people to stand on it at once and see if they can break it. Then double or triple it in size for a good margin of safety. From the beam I chained a come-along which is a ratchet cable lift. By sliding the beam far aft on the companionway, you can get it nearly above the engine but not quite. Therefore, in order to avoid the potential disaster and danger of the beam sliding aft and entirely off the companionway when you go to lift, it is very important to secure it somehow (i.e. with ropes) so that it is impossible for it to move any further aft. When you go to lift, the pull will be from ahead of the engine center-of-gravity and once free it will want to swing forward. This was easily manageable by two of us, one to work the lift and another to manhandle the engine until it was free and fully supported by the beam. But let me say again, this is why it is important to secure the beam because the initial lift will try and pull it aft off of the companionway. Actually, this takes us one step further, which is to slide the beam (use large hammer and put rags under beam to prevent scratch’s) forward until the engine is hanging in the middle of the floor. Depending on your situation, you may already have the engine where you want it. I wanted it a little more out of the way, since I expected a month or more of work. 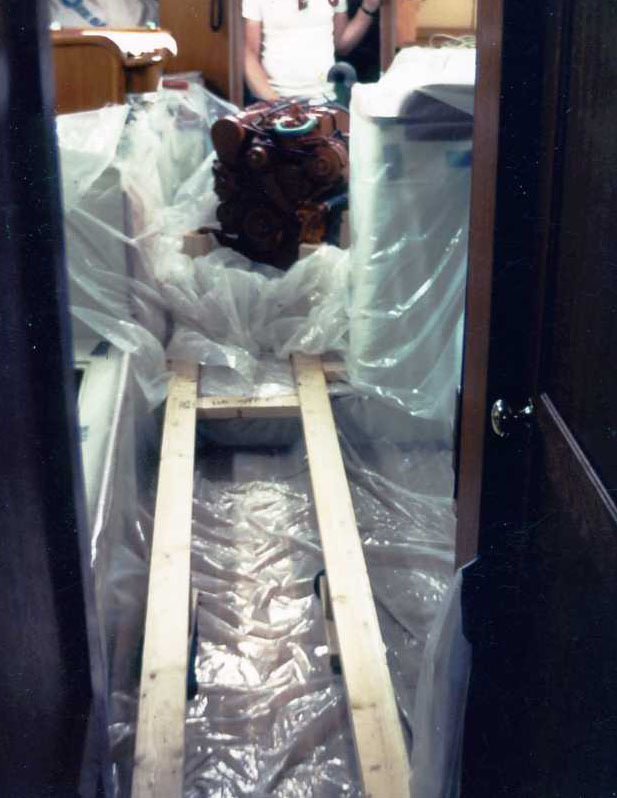 The plan was to put it further into the cabin like a giant centerpiece and where crawling around it was easier. I built a kind of crude wooden railroad down the center of the cabin. A wooden railway car for the engine was fabricated with a flat bottom. (i.e. picture your coffee table turned upside down with the engine resting on the legs) It rolled on 4-5 pieces of 3/4″ steel pipe which were recycled to the front each time one rolled out the rear. Here you see the 2″x4″ that make up the railway. Note underside supports in middle. Railway makes a slight turn (hidden) back where the engine is. Engine is sitting on its car which is mostly hidden by plastic. If this all sounds like a lot of trouble, it wasn’t. This was all done while on a mooring and without dock power or conveniences. Having the engine out is a great time to slap on a coat of paint and clean up the engine room.